I've got to catch up on my magazine reading. All of my magazines are delivered to my parents' house, so I get them a little later than usual. -Paul Mitchell Extra Body. The product has been mentioned so many times on my blog. I love it. It's perfect for teasing or adding that second day dirty hair texture instantly. -OPI You Don't Know Jacques. Oddly enough, I went to three beauty stores to find this after passing it up several times last year. No one had it. Then Ulta, which was the first place I checked, had a ton of them. -OPI Ogre-The-Top Blue from the Shrek collection. What a weird collaboration. Anyways, all of the colors are super fun and bright, so I'm on board. -Almay Clear Complexion Foundation is my go-to foundation. It's perfect for every season and blends beautifully. Nasty Gal introduced some new wedges. Now, as we all know, I'm a sucker for wedges. 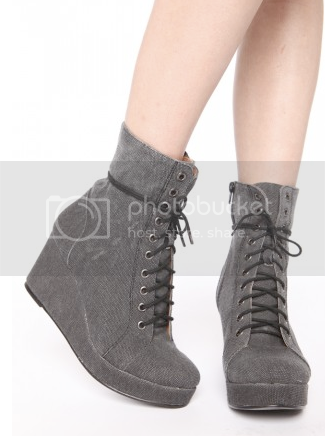 I can see myself wearing the Front Canvas Wedges more than the Xanadu Wedges. The Xanadu's are a little too space rocker, even for me. Though I'm excited to see who is going to scoop them up and really show off how extreme they are!